Turning a snapshot into a photographic work of art is exciting. I will never forget using Photoshop 3.0, playing with effects to make my pitiful photos look like something cool. Now 101 PhotoFilters by MacPhun looks to bring some of that fun to your iPhone. Butterflies Are (Nearly) Free: A frame composed of butterflies is just one of the filtering options you’ll find in 101 PhotoFilters. Opening the app presents you with a blank frame, where your picture should go. Great. Your first instinct to tap the frame and choose a picture would be, well, wrong. Instead, the folder icon at the bottom of the screen brings up your photo library, from where you choose an image. The icons at the bottom also include a camera, for taking pictures to edit within the app; a gear to change photo resolution; and an arrow to revert to the original image. The other buttons on the screen are where the fun begins. The Select Filter button opens up 102 different options for filtering or altering your photo, including everything from grayscale to over-burn. The number of filters is impressive, although some are frivolous. After all, does your picture really shout out for that frame made of butterflies? Tap the “apply filter” button, and the magic happens. A progress bar shows your wait to see your masterpiece; once finished, you can save the image or try another filter. You can even layer several filters together, allowing effects like a filter and a frame. Pro tip: Pink Hue and a Teddy Bear frame makes anyone look cute. Chances are you’ll never need all the filters included, and there is a lot of filler here to get to the promised 101 filters. Still, I have found seven or eight that I use regularly, making the app—on sale for $1 as of this writing—worthwhile. And lets face it, my kids love that Teddy Bear frame. 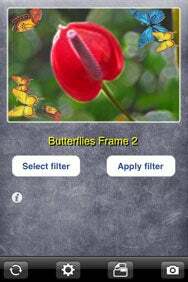 101 PhotoFilters is compatible with any iPhone or iPod touch running the iPhone 2.x software update.